1968 ad" "Women of the future will make the Moon a cleaner place to live." 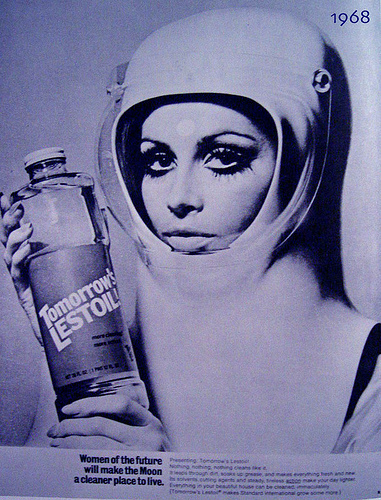 In 1968 women wore "futuristic" helmets during house cleaning. After cleaning, wearing the fashionable helmets to shopping and lunches was considered a must. My own mother couldn't afford a helmet, so my dad constructed one out of cardboard and duct-tape. He painted it gloss white. I thought it looked authentic, but she finally stopped wearing it when she noticed some of the neighbor ladies laughing behind her back. Thankfully, such strict standards are no longer required.